The Open Biotechnology Journal is an Open Access online journal, which publishes research articles, reviews and letters in all core areas of biotechnology including basic and applied research e.g. molecular engineering of nucleic acids and proteins, molecular therapy, imaging technology and large scale biology, regenerative medicine, analytical biotechnology, food and agricultural biotechnology and environmental biotechnology. 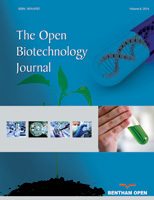 The Open Biotechnology Journal, a peer-reviewed journal, is an important and reliable source of current information on developments in the field. The emphasis will be on publishing quality articles rapidly and freely available to researchers worldwide.